Kat, Lillia, and Mary are unlikely allies, but they unite when they realize they share a common goal: revenge. Each girl has a different target and a different reason for seeking vengeance. The trio make a pact to see their plans through to the end—no one can bail on the other two once her phase of the scheme is over. The girls’ designs get off to a smooth start, but some unanticipated developments make them realize that payback may not be the solution. 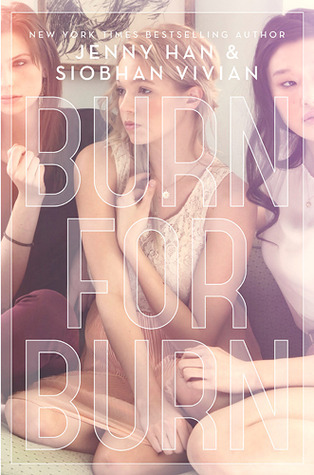 Burn for Burn is a tale of three teenage girls out for revenge, and it is a compulsively readable one at that. I’ll admit right now that my morbid curiosity about how the trio would exact retribution propelled me through the pages of this book. I’m not saying that I approve of the girls’ actions, the goal of which was public humiliation more than anything—never physical harm. I must concede, though, that their plotting made for some riveting reading. Lillia is a model student and daughter whose traumatic experience over the summer makes her extremely protective of her younger sister, Nadia. When Lillia fears that Nadia is being taken advantage of by an older boy, Lillia wants to teach him a lesson. Kat used to be best friends with another girl named Rennie until Lillia came along and Rennie saw better social opportunities being by Lillia’s side instead of Kat’s. Now Rennie delights in spreading vicious rumors about Kat, whose quick temper always causes her to rise to Rennie’s baiting. The third member of the future alliance is Mary, a recent returnee to Jar Island. She’s come back to show how much she’s changed to a single person—Reeve, the star of the school football team. At first glance, all three girls make convincing cases for pursuing vengeance. I found Rennie instantly unlikable; she’s your archetypal mean girl, and not just to Kat. Rennie is also selfish and shallow, and really, I looked forward to seeing her get her comeuppance. Tied with Rennie in that department is Reeve. The details of what happened between Mary and him aren’t revealed until toward the end of the book, but they’re perhaps the most startling and repugnant, especially in light of the aftermath. As for Alex, the object of Lillia’s revenge, I never truly believed that he was capable of the behavior that she suspected him of. He’s not perfect, but he certainly isn’t in the same category as Reeve and Rennie. Burn for Burn reads like a contemporary novel except in a few spots where there’s this very oddly placed paranormal element. I think it’s supposed to be subtle, but it’s not very well integrated into the story at all, thus making it stick out like a sore thumb. To me, the book stood fine as a contemporary. I wonder where the authors plan to go with the supernatural thing in the next book; it definitely needs to be fleshed out better. This was a quick read for me, mostly because I wanted to see how the trio’s plans played out. (So very wrong of me, I know, but then I’ve always been a grudge holder and could relate to the girls to an extent.) The writing and the characterizations are on the ordinary side; the plot is what makes this worth a read. If revenge stories interest you, Burn for Burn fits the bill. I am a little curious about the direction the story will take in the upcoming sequel, Fire with Fire, which I’ll probably get around to checking out; it’s not a high priority read, though. I agree with you - I think this would have been a great contemporary read by itself. The paranormal aspect just felt forced. Exactly. It kind of came out of nowhere and never found its place in the story. Hope to see it developed more in the sequel. I got the first two books. The story sounds interesting and reminds me of those girls who gossips a lot at high school lol. But, why in the world is there a bit of paranormal when it's a contemporary o.O ? I asked the same question, lol. I'm eager to hear what you think of both books! Aww I was hoping this one would be awesome..might be a pass for me! I thought it was OK, but not the type of book I'd reread. The weird supernatural bit really left me scratching my head.